Anything else that is not rest of it. I’ve released new version of My Personal Kanban, browser based Kanban board. There are new features as well as simple upgrades to libraries, etc. I also removed Bootstrap UI library. Per column limits – possibility to setup limit of cards in the column. If the limit is reached, it’s impossible to add or drag more cards into column. No restrictions to the number of columns. Previously you could only create Kanbans with 3,4,6 and 8 columns. Now it is possible to create Kanban board with any number of columns between 2 and 10. It is also possible to add and remove columns via a column settings menu. Future plans for My Personal Kanban will include auto-sync with cloud and some major changes in the cloud sync protocol. I need to make those changes before I start development of a mobile version of MPK. I do hope that new features come in handy and that you will keep on using MPK as your personal Kanban board. I’ve released a new version of My Personal Kanban. My Personal Kanban is a very simple in-browser Kanban Board application. It is designed to work with no Internet connection, persisting content in a modern browser’s data store. MPK can also store your Kanban encrypted in the Cloud with full data privacy. New features follow closely previously delivered functionality extending into the specific requests by some MPK users raised on GitHub. • Importing previously exported Kanban from text (JSON) file. It’s a follow up on Export functionality from previous version. • Change colour of a Column. This functionality comes with a new Column settings button. • Possibility to select existing Kanban as a Template for New Kanban. If there is a specific structure, column names and colours that you like, you can reuse the setup when creating new Kanban. • Each Kanban has a unique URL in the Browser address bar, which makes it possible to open or bookmark specific Kanban (this change forced me to introduce Angular.js router, a bit of info for devs). I’m also planning a Mobile version to follow on both iOS and Android platforms. I would love to hear from you if you are using My Personal Kanban, in what way and what functionality is missing. Not too long ago I finished working on a new release of My Personal Kanban. It is a small Open Source project that I have been working on. The aim is to provide a very simple Offline Kanban board in a browser window. The latest release contains one major improvement for Cloud Uploads. It encrypts (ciphers) Kanban with user provided Key before uploading it into the Cloud. Thus, there is no possibility to view or decipher Content of the Kanban as the Key is not uploaded to the Cloud but only stored in your browser local cache. The only data stored by Cloud in the readable form are: username and email address. In the wake of recent Spying and Snooping events, I believe this feature of My Personal Kanban should provide ease for everyone concerned about their privacy. I’m using Rabbit encryption algorithm from CryptoJS library. The latest release 0.4.0 also includes some bug fixes and code cleanup. You can grab it from here. Once you have the new version, when you upload for the first time, the Kanban will be encrypted. Next release that I am currently working on, will include persistence to a local Cloud storage (a small version of Cloud application running on user network and user server). Recently I have finished some work on the TeamCity Crowd Plugin. This plugin enables TeamCity to use Crowd for user authentication. It could be used in places where Crowd is used to manage access to other products (for example Atlassian JIRA or Confluence). Thanks to this plugin the same user base will be able to access TeamCity. The plugin is open Source, available on GitHub, binary build downloadable on BinTray. TeamCity Crowd Plugin is using Atlassian Java REST Client to connect to Crowd. More detailed description of functionality on GitHub. Please do get in touch with feedback/improvements. I did spent some time adding new feature requested by my Wife. Links, in card details field, are now supported as real HTTP links, which could be opened. I did remodel slightly the Kanban Card dialog to support that. The other new feature is the possibility of changing look of Kanban. The feature comes with easy way of adding own styles. The video bellow is a quick overview of the new features. You need to create a css file with styles and copy it into: my-personal-kanban-folder/styles/themes/ folder. Name doesn’t matter, however you will need to use this name in last step. The default-bright.css and default-dark.css can be used as a starting point for your own styles. Prepare image capture for the new style and place it in my-personal-kanban-folder/img/themes/ folder. It should be a jpg no bigger than 150px in width with the same name as the css file (you can see that there are default-bright.jpg and default-dark.jpg in that folder already). Last step is to open the themes.js file from my-personal-kanban-folder/scripts/ folder (it will have a funny name like 5ebce75f.themes.js ) and add entry for your new theme. Name is the property that will be displayed in the Drop down. css is the property that will be used to find the css and jpg file prepared in steps 1 and 2. I’ve just released new version of My Personal Kanban. 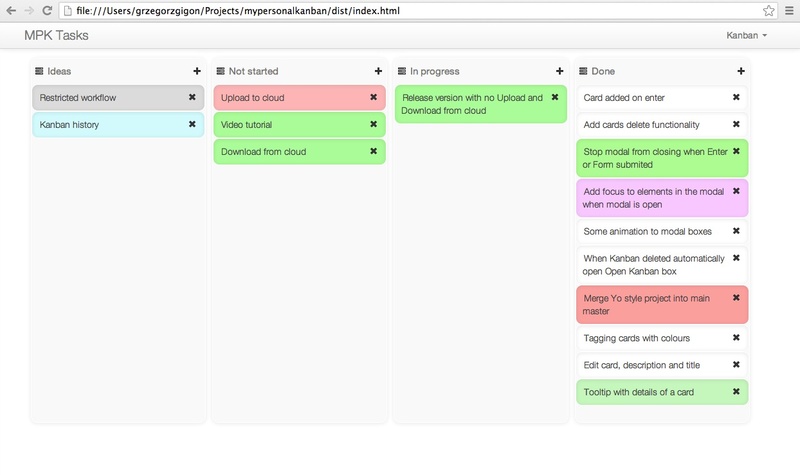 You can check it out at http://greggigon.github.io/my-personal-kanban/ . My Personal Kanban is offline Kanban Board that runs within web browser. Why Kanban for personal stuff? Kanban is lightweight enough to bend to my personal lifestyle and to the way I do things outside work. I used a simple TODO list but I wasn’t happy with it. Kanban gives me clear overview of things that need to be done, things I’m working on and stuff I finished. It also provides way of prioritizing the work (by color coding or bubbling the most important tasks to the top of the columns) and clear visual aid for reviewing tasks. By limiting Work in Progress I can make sure I stay focused on task and finish it. By looking at the last column with things done I can give myself a tap on the back for achieving task completion.